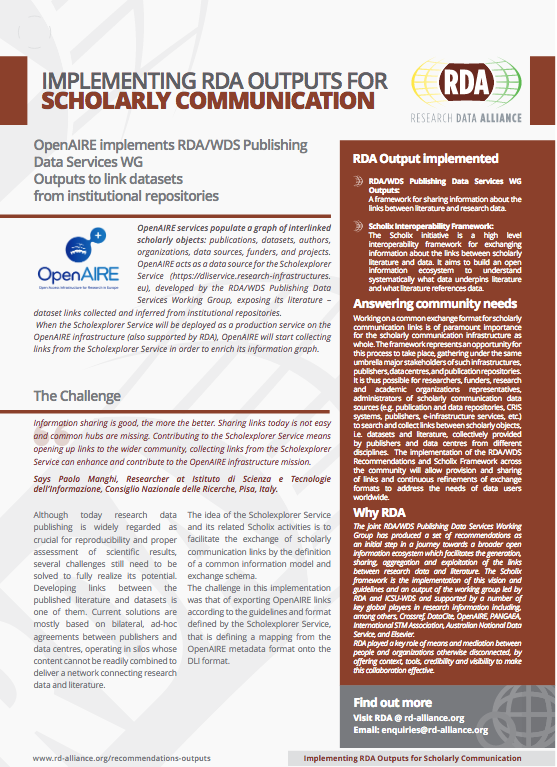 OpenAIRE implemented the RDA/WDS Publishing Data Services WG Outputs to link datasets from institutional repositories. Which RDA outputs have been implemented? OpenAIRE is an EC-funded initiative that aims to support the Open Access policy of the European Commission via a Networking and a Technical infrastructure. The OpenAIRE services populate a wide graph of interlinked scholarly objects: publications, datasets, authors, organizations, data sources, funders, and projects. It acts as a data source for the OpenAIRE Scholexplorer Service , developed by the RDA/WDS Publishing Data Services Working Group, exposing its literature – dataset links collected and inferred from institutional repositories. RDA/WDS Publishing Data Services WG Outputs: A framework for sharing information about the links between literature and research data. Scholix Interoperability Framework: Interoperability framework for exchanging information about the links between scholarly literature and data. The EC-funded initiative aims to support the Open Access policy of the European Commission via a Networking and a Technical infrastructure. Scholarly data sources should all become Scholix compliant in order to export links in an interoperable way, participate to the Scholix ongoing discussions and, most importantly, to consider the inclusion of links collected from other parties, such as the Scholexplorer service. Seamless exchange of information about literature and related data will facilitate re-use, reproducibility and transparent evaluation of science; all steps made in this direction are immensely valuable. Read OpenAire’s practical experience on adopting these outputs here.